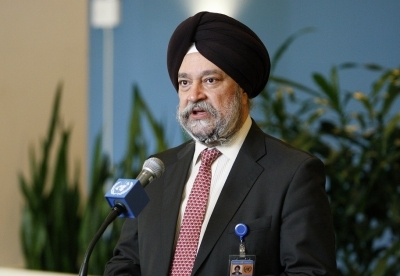 United Nations July 12 (IANS) India has to build between 700 million and 900 million square metres of green urban space every year to meet the needs of a fast-rising rising urban population that will reach 600 million by 2030 according to Housing and Urban Affairs Minister Hardeep Puri. "India s urban agenda will constitute one of the defining projects of the 21st century " he told the High Level Political Forum on Sustainable Development on Wednesday. Explaining the magnitude of the task for India he said on that it was the equivalent of building every year a Chicago the third largest city in the US. By 2030 40 per cent of the Indian population would be living in urban areas up from 30 per cent now and 17 per cent at Independence he said. About 70 percent of the urban infrastructure needed for this size of the urban population has yet to be built and they should be green and resilient he added. "India is in the process of creating 100 Smart Cities to strengthen urban infrastructure by applying smart solutions and giving a decent quality of life to citizens " he said. To meet the challenge of providing housing for all he said India had embarked on "the world s largest housing programme for the poor" - the the Pradhan Mantri Awas Yojana. He added: "The government aims to build 11 million affordable homes for urban Indians by the year 2022. We have already sanctioned over 5 million and are confident of meeting the targets by middle of 2019." Outlining the challenges faced by India Puri said: "We remain confronted by a complex ecosystem of urban challenges through and in ensuring housing for all technology based solutions to enhance service delivery better mobility and greener transport smart governance and in doing more with less." Puri is also the president of the governing council of UN Habitat the world body s programme for developing sustainable urban settlements and housing for all. He said: "Today more than 90 percent of the global urban growth is occurring in the developing world. India China and Nigeria together will account for 35 percent of the growth in the world s urban population between 2018 and 2050." According to UN Habitat six out of ten people around the globe will be living in an urban area by 2030 when the UN s Sustainable Development Goals (SDGs) set at a 2015 summit are to be realised. More than 700 cities will have populations of over 1 million by 2030 according to UN Habitat. Emphasising the importance of urbanisation UN Habitat says: "No country ever reached middle income status without being urbanized and cities generate around 70 per cent of global gross domestic product." "Cities are the spaces where all SDGs can be integrated to provide holistic solutions to the challenges of poverty exclusion climate change and risks " UN Habitat Executive Director Maimunah Mohd Sharif said at a news conference.